Solve Tickets. On Time. Every Time. Ensure better service, avoid violations using SLA automation. Create site-specific SLAs to ensure better service across all your operational sites. 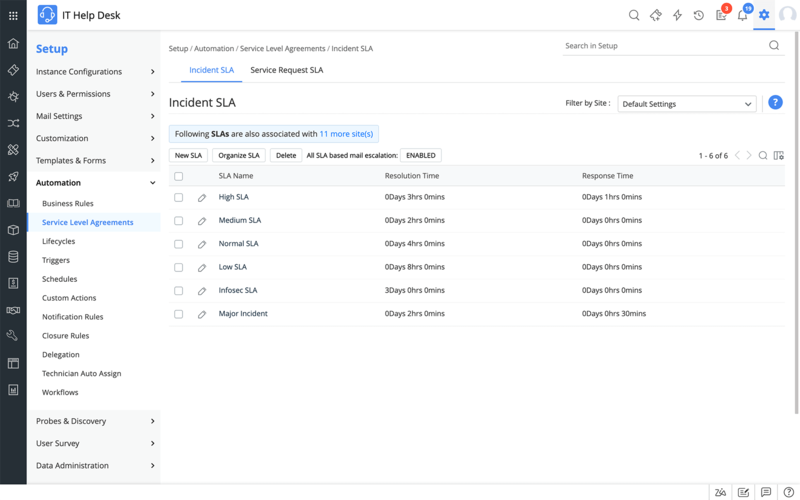 Configure separate SLAs for incidents and service requests. 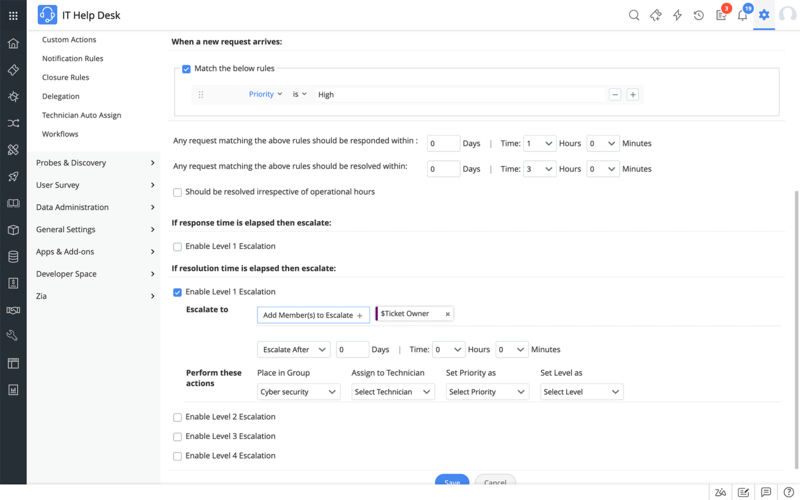 Configure response time SLAs and appropriate escalations to ensure faster response to end users. Ensure automatic assignment of SLAs to incidents based on inbound ticket parameters like priority, impact, urgency, department, requester, service category, VIP user, etc. Pause SLA timers when awaiting end-user responses to prevent unnecessary escalations and violations. Choose to set service level targets irrespective of business hours, holidays, or weekends for high priority and high impact incidents. Ensure maximum SLA compliance with the help of multi-level proactive and reactive SLAs. Handle SLA violated tickets and those approaching violations effectively by moving them to different groups, reassigning them to a different technician, or by resetting their priorities and levels. Get a visual cue of SLA violated tickets with the 'red flag' icon on the requests list view. Create custom templates for response SLA escalation and resolution time SLA escalation emails. With ServiceDesk Plus, Tranter IT Infrastructure Services Limited prides itself in meeting all its SLAs and consistently maintaining the up-time of the IT infrastructure and services.